Art is seen as a solitary, even a reclusive, endeavour. But visual artists, writers and musicians often find themselves energized by a collective environment. Sharing ideas around a table has always provided a starting, and a continuing, place for fruitful exchanges between artists of all kinds. 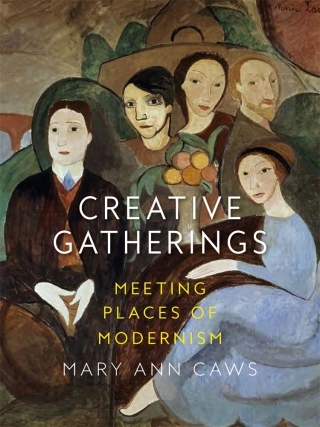 In her charming new book, Mary Ann Caws explores a rich variety of gathering places, past and present, which have been conducive to the release and sustenance of creative energies. Creative Gatherings surveys meeting locations across Europe and the United States, from cityscapes to island hideouts, from private homes to public cafes and artists’ colonies. Examples include Florence Griswold’s house in Old Lyme, Connecticut, meeting place of the Old Lyme Art Colony; Prague’s Le Louvre café, haunt of Kafka and Einstein; Picasso’s modernist hangout in Barcelona, Els Quatre Gats; Charleston, gathering place of Virginia Woolf, and Vanessa and Duncan Bell; and the cafés of St-Germain-des-Prés and Montparnasse: the hangouts of Apollinaire, Sartre and Patti Smith. The book interweaves 200 examples of collaborative artworks throughout the text, with 120 in colour.